When starting any Japanese role-playing game (JRPG), it’s easy to instantly expect that it will have anime-styled characters, turn-based combat, a foreign land, and a main character who has no idea why they are there. 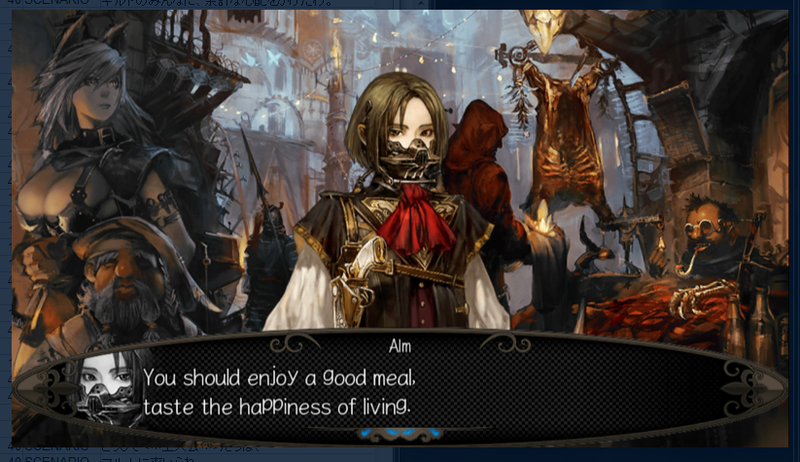 Stranger of Sword City contains all of these JRPG clichés, but it fortunately has plenty of atypical features to keep it standing out amongst the JRPG herd. Doing something different is often refreshing, but it’s not always well-executed or well-received. 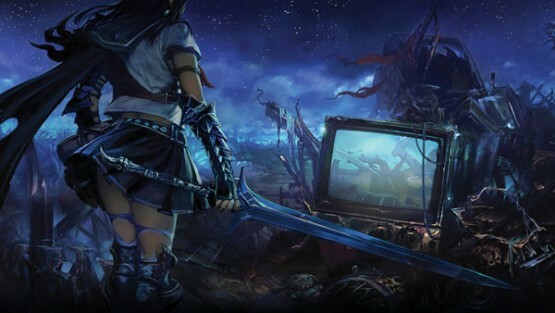 Stranger of Sword City originally released in Japan only back in 2014 for the Xbox 360 and then it was ported for the Vita early 2015. NIS America has taken this unique gem in their own hands for our playing pleasure, and it’s here for Xbox One and the Vita. Personally, this game is far more suited for the Vita, as it’s ideal for bursts of grinding. Oh, yeah the classic JRPG grind for experience (and grind on your patience) is alive and well throughout Sword City. After extensive character creation, which actually includes a batch of models from western RPG styles as well as the typical JRPG art, the player is flung into Sword City. As expected, it wasn’t by the character’s choice. As soon as the character comes to and sorts out where they are, monsters suddenly attack. This also isn’t by the character’s choice. Thankfully, a pro at monster-fighting shows up and helps the protagonist fight through their first turn-based battle. Even though this is a tutorial, and therefore the battle should be taking it easy on the player, it most certainly does not. Don’t focus too much on the fact that there are only two of you and make your battle selections wisely. It turns out that the main character is one of many people who were magically whisked to Sword City for reasons unknown to everyone there. No one seems to be scared or that upset about it, and they’re happy as Strangers to fight monsters and help the local populace. Special Strangers can be Chosen Ones, which are able to procure precious Blood Crystals from Lineage Type monsters. It is said that by obtaining these Blood Crystals is how the Strangers will be able to return home. Of course, the player is such a Chosen One, as if there was any doubt. Dungeon crawling is a way of life for the JRPG. Typically it’s done either in a top-down or a third-person point of view, but this time, you’re in first-person point of view. If anyone is as old as me, you may remember a delightful NES game called Fester’s Quest that featured 3D mazes from the first person perspective. Strangers will roam dungeons in this fashion, but at least this time, unlike Fester’s Quest, there is a mini-map on the screen to show which way you are going. All maps are saved in your journal as well, which makes it far easier to retrace steps when you return to the dungeons. And yes, you will retrace dungeons numerous times. When you crawl these dungeons, you will not bring along whimsical new characters that you meet during your journey who will bring new twists to your story. You will be given a random set of five party members. If they fall in battle, you can bring them to the infirmary to be revived, which either costs a fortune or a day of real time. And then you get to create new party members from scratch! If you don’t create new ones and add them to your roster, your Morale will lower, and Morale is needed to hide and ambush enemies and activate vital abilities. Morale can be lost when party members fall in battle, and winning battles increases it. The Blood Crystals the player is supposed to be harvesting grant these special Morale-triggered abilities. When the Chosen One gives a Blood Crystal to one of the three Vessels in Sword City, a specific ability will unlock. Choosing the Vessel quickly becomes tantamount to having an upper hand in battle, as well as determining how you prefer to play. The fact that grinding is key to survival should not be a surprise for any JRPG; it should honestly be expected. The grind is imperative for survival, especially since it’s easy to experience quite the turnover with your party. Keeping them alive is difficult, as revival items and potions are expensive, and battles yield few Blood Gems to purchase them. Having a healer is of course crucial, but you probably won’t have any items to replenish his or her MP when that eventually runs out. If you happen to find a butterfly nest, you can warp out of a dungeon and return to the Strangers’ Guild, which revives everyone instantly. But if not, good luck limping out of the area, and perhaps you should plan a couple of days to not play the game while your dead revives in the hospital. It’s easier to do that instead of create a new low-level party member. Sadly, there isn’t much to do outside of the grind. You’re tasked with finding as many Blood Crystals as possible, and you’ll get clues by talking to NPCs as to where to find the Lineage Types your Quest Log orders you to find. For example, one Lineage Type is afraid of humans, so if you have any humans in your party, you’ll have to go where she resides and hide to ambush her. Another comes out if you’re carrying chocolate in your bag. Enticing these types to leap out and attack calls for patience, luck, and lots of revisiting a dungeon. The grind ends up being more than a way to level up; it’s the entire way of the game. 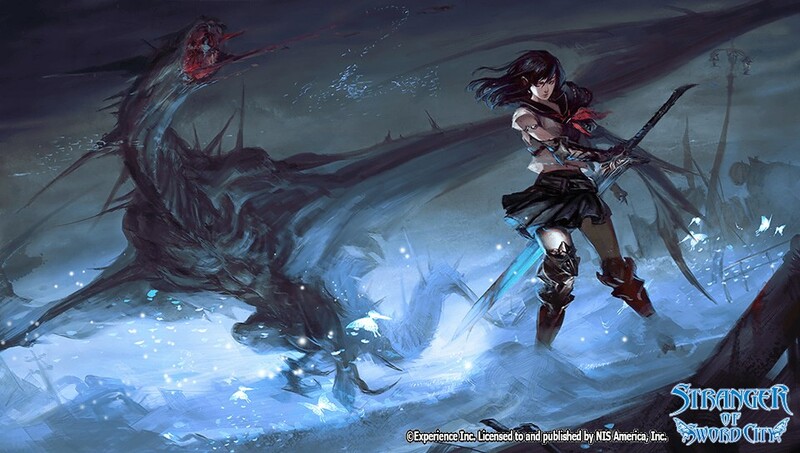 Stranger of Sword City will either be a refreshing yet challenging diversion from the genre or a completely frustrating experience that will cause a Vita to go flying across the room. I found it to be a mixture of both, and I started several new games to see the differences in the adventure depending upon my class and/or race choices. I even tried out the beginner difficulty and learned that the game still didn’t let up on the punishment. Its idea of easing up was to lose two party members in a Lineage Type battle instead of three or four. But I still never had enough money for a quick revival in the hospital. That was the biggest racket I’ve ever come across in a game. That said, I somehow did enjoy my time in the Sword City. There’s something about the title that will grab hold of you and entice you to play more, grind more, and try to figure out how to keep your party alive just a wee bit longer. Grab your sword, prepare to enjoy that character creation menu, and get ready to spend as much time in the hospital as in a 3D dungeon labyrinth. It’s time to be a Stranger. Stranger of Sword City review code provided by publisher. Reviewed on PlayStation Vita. For more information on scoring, please read our Review Policy here. Creative battle techniques with hiding/ambushing, using Blood Crystal abilities, Morale points, etc.